I´ve been dying to get my hands on these masterpieces of the two for ages! Please please please repress!!! Well, we definitely need a repress on this one. Please! Repress of this with the proper albumcover would be awesome. Be warned. It seems all vinyl copies of this have terrible surface noise. So loud sometimes you can hardly hear the music (which is quiet ambient). I bought one "mint" copy - it was unlistenable. Sent it back. Wrote to other sellers and all agreed their copies had annoying surface noise. this album is one that stands like a rock,ambient with a touch that you move to a other state of mind !great minimal from the best artists ever. These words will have difficulty describing the exquisite detail and nuance crafted by Alva Noto and Sakamoto. This is a beautiful union of piano and electronics, and likely the only of its kind. 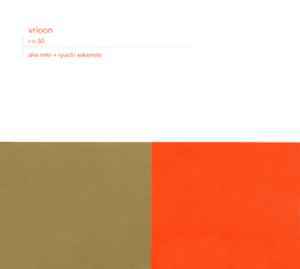 Vrioon is a more organic and meditative work than their later collaboration on Insen. True appreciation of such intricate and sympathetic sonic delicacies calls for a learned ear, but hearing and recognizing the curious interplay in this sparse acoustic-electronic dialog is joyfully easy. Lovers of ambient, experimental and glitch styles will adore this. It is lovely, thought-provoking music. I absolutely love this album. There's something about it I can't put my finger upon. Carsten's pure tones, bleeps, and buzzes are so contrasted to the minimal, nearly ethereal piano of Sakamoto, especially as the piano is heavily treated with sustain whilst the glitchy soundscapes tend to be composed of shorter or at least more terse "syllables." On one side, organic; on the other, mechanical and cold. Truly an ambient album (there is a distinct environment one steps into), it's a vision of what's to come that embraces the past, a "Music For Airports" remade for Futurist flights in Art Nouveau vessels. If you like this try "Three White Roses and a Budd" a collaboration between Fila Brazillia and classical Pianist Harold Budd. Or Harold Budd's collaboration with Brian Eno "The Pearl". They both feature classical piano, just like Sakamoto on this release, mixed with the type electronic music the collaborators are famous for. The feeling of immense sadness overwhelms me when listening to the beautiful music by Alva Noto and Ryuichi Sakamoto. The web of music is so thin, so fragile as if it might break any second and yet it brings a feeling of true perspicacity, is really touching and soothing. Melancholic Piano combined with noto's sine waves and clicks. I play it at the office and drive everyone crazy cause they don't think the sine waves, etc are part of the CD. Very subtle.